I was pleased to be offered a collection of lovely little journals from Amber Lotus Publishing and decided to review them as a group. Each is just a bit bigger all around than a paperback book, but thin enough to easily slip into a backpack pocket, or purse. At least one of them are coming with me on my future travels, they are perfect for musings, plans, and journaling my adventures. All are made from recycled materials and printed using soy-based inks. And all are simply lovely. 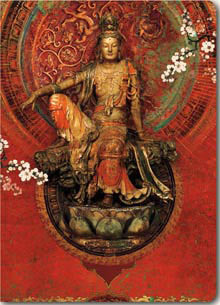 Kwan Yin, from the eclectic and innovative Duirwaigh Studios features Her Serene Highness on the cover. White blossoms frame her, as does a mandala-like image behind Her. Pieces of images from the cover are scatter throughout the journal, marking the pages in various ways. 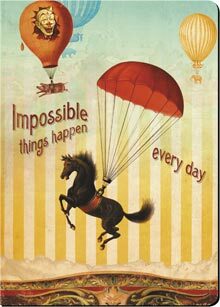 Impossible Things Happen Every Day is also from Durwaigh Studios. A horse falls through the air on a red parachute, a pig flies with the aid of a clown-faced balloon, a blue bear hangs below a blue balloon and gondola, and a yellow elephant floats gently suspended from a yellow balloon. This is a fun and engaging journal, one that invites you to experience a sense of play and humor. The pages feature bits of images from the front, but also deeply silly images gleaned from elsewhere. There are finger puppets, rodeo clown drawings, a rabbit-wrangling clown, and many other such images. 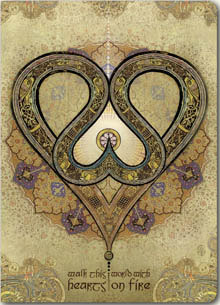 Celtic Blessings from Michael Green features an intricately drawn and colored Celtic 'heart' on the cover. Golds, purples, and many shades of brown and green make for an elegantly decorative color. We are encouraged to "walk this world with hearts on fire" and inside pages feature more of Green's intricate Celtic drawings. The last journal is Spread Your Wings from artist Lydia Hess. 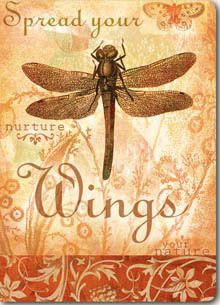 "Nurture Your Nature" says the dragonfly -- symbol of change in perception, power, courage, poise, and the dreaming mind. Elegant winged creatures -- birds, bees, and other winged insects grace the inside pages. We've reviewed several of Amber Lotus' journals before (see here, here, and here). Moreover, they have a scrumptious collection of calendars using the art we've seen on the journal covers. Check out their offerings on their website.